2018 update: I’m finally back running a couple of IGates for APRS, one (N0RQ) on the standard frequency of 144.390 MHz, and the other (N0RQ-14) on the alternate APRS freq of 144.340 MHz, which does get used some here in the DFW area. Setup for each station is an old GE MVS rig, Kantronics KPC-3 (not “Plus”), UI-View (yep! ), on desktop computers (one Win10, one old WinXP boatanchor). Thanks to Pete, AE5PL, and Kirwin, N0XLR, who helped with APRS advice during various stages of this little learning endeavor. First, I am not an expert on APRS by any stretch of the imagination. However, I did manage to get 1 fixed base station transmitting and receiving APRS, and 2 mobile trackers going successfully — and relatively inexpensively. Since those early endeavors, I’ve also set up 2 digipeaters and 2 I-gates as well (details here). First, the 2 mobile trackers. I went with “dumb” (no computer) mobile trackers — I can transmit location, but can’t receive anything, which is all I wanted. 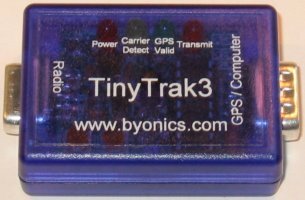 I got the TinyTrak3 — ~$30 as kit, ~$50 as assembled — found at the Byonics web site. Make sure to get the case if you don’t have one, as well as the gender changer / null modem adapter, so you can program your TT3 with your computer. The TT3 is a neat little device. Make sure to download the .pdf instructions before you buy it, so you know what you’re getting. It is relatively easy to get up and running. Also make sure to download the configuration software, which is pretty easy to use, and the instructions are good. eham.net has a review of the TT3. Soldering small things isn’t my forte, so I got the assembled version. One neat little feature in particular — it has a primary and a secondary configuration, which can easily be switched with an inexpensive switch. This is great for us — one side is programmed with my callsign, and the other is programmed with my wife’s. We have a switch up front in the car to make it easy to flip back and forth between the two. Other folks might use it to have different beacon comments, or use flip smart beaconing on or off… but that feature certainly is useful! For a GPS receiver, I went with a “blind” (no display screen) GPS — the Deluo™ GPS for PC/Laptop (GM-305, Serial-RS-232). (Make sure to get the right one — not the one for USB!) [This model is no longer available, but there are others…] It is small (essentially the same size at the TT3 case! ), inexpensive, and truly plug and play. The only thing you have to do to it is give it about 5vDC of power, as it wouldn’t like 13.8 volts very much! This can be done in a variety of ways, but my solution was to go down to the local Radio Shack and find a DC power converter — they have several models ($15 or so), so you just have to choose one with the right voltage output and amperage capability. Then a female PS-2 (round) connector was wired up to the RadShack DC converter — making sure to get the + and – on the right pins! 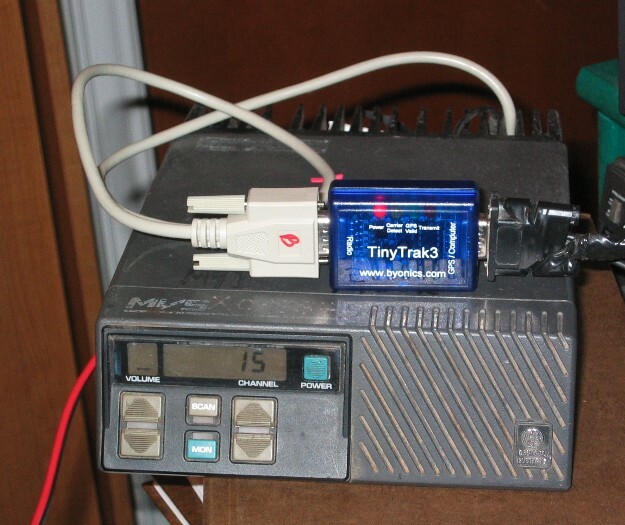 The Deluo GPS has 2 connectors on it — one to plug into your TinyTrak3 (normally it would plug into a serial port on a laptop), and a PS-2 male (like a keyboard or mouse plug) to plug into a computer keyboard or mouse port, which gives the GPS its 5vDC of power. All you do is plug both things in, and it works. There are other modern SERIAL GPS units that would work fine as well, as long as they have standard NMEA output. You’ll need a cable to go from the TinyTrak3 to the radio — wired up like a Kantronics KPC-3+, I believe — depending on your radio, of course. For a radio for the mobile trackers, we use a Yaesu FT-1500M unit (which have a data port, making it easy) in one vehicle, and a GE MVS commercial rig in the other.